When my grandparents visited me in November we went to a bunch of restaurants and cafes but one that stood out to me was the one in their own hotel. Premier Inn is a budget hotel that is actually really nice! Having their own restaurant is so helpful as well as it means you don’t have to travel too far to find breakfast, lunch or dinner. When I went they had a burger special on where they had eight different burgers all with different fillings based off different countries! I went for the French one as I am not a huge fan of beef and this was one of the only chicken burgers they had (they also had lamb burgers too). With this burger it’s like a normal chicken burger but comes with camembert in it too! Absolutely heaven! 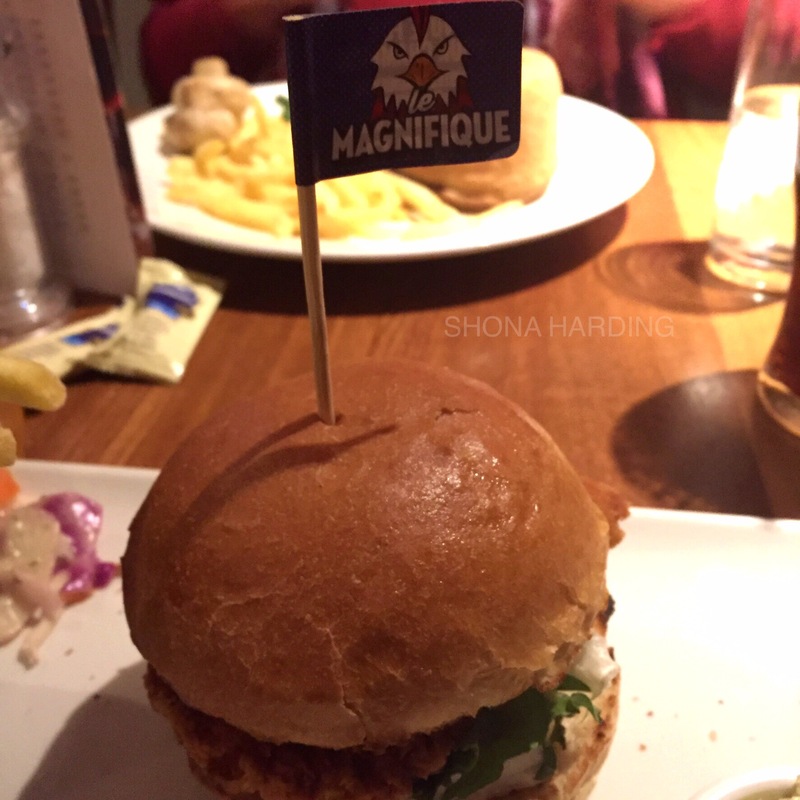 The burger was so filling and the camembert complimented the chicken so well! If you want a twist on a normal chicken burger I definitely recommend adding camembert to it! 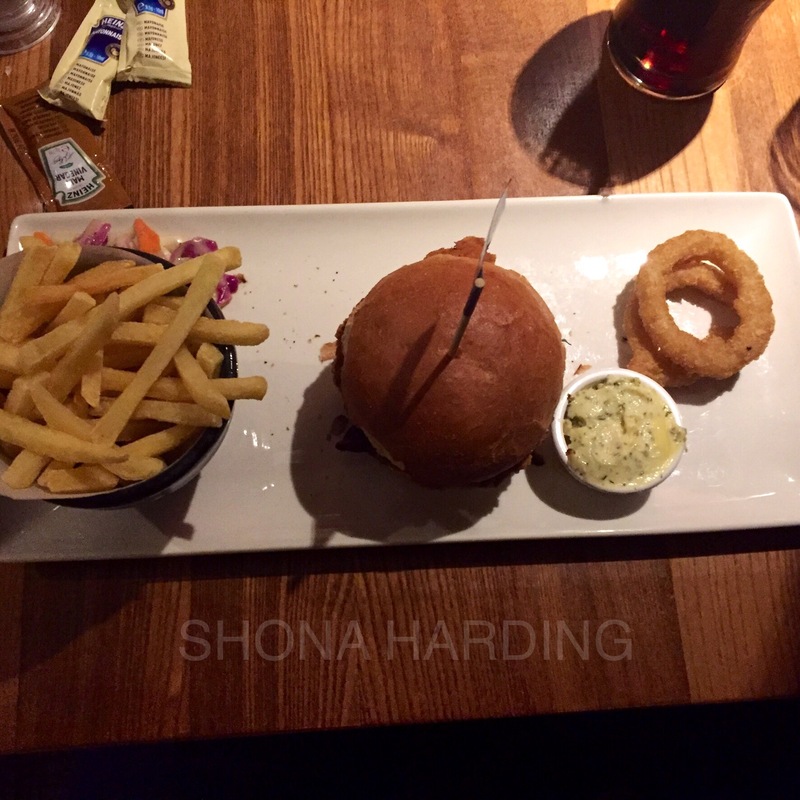 With the burger you get chips, garlic butter, onion rings and coleslaw. The garlic butter was amazing! I was scraping the pot trying to get more! It was really strong but you soon got used to it. The coleslaw had a lot of flavour and had red cabbage in it which is different to normal white cabbage. This addition meant that there was a different flavour to it but it was a good change to have. The chips, honestly I am very specific with thin chips so I prefer fat ones but these were quite nice and had a good crunch to them. When it came out the burger was quite small but believe me it filled you up like crazy! It was absolutely delicious! When I went before I had the BBQ chicken and bacon salad which was a great healthy dish that had a lot of flavour but I am so glad I went for a burger this time. 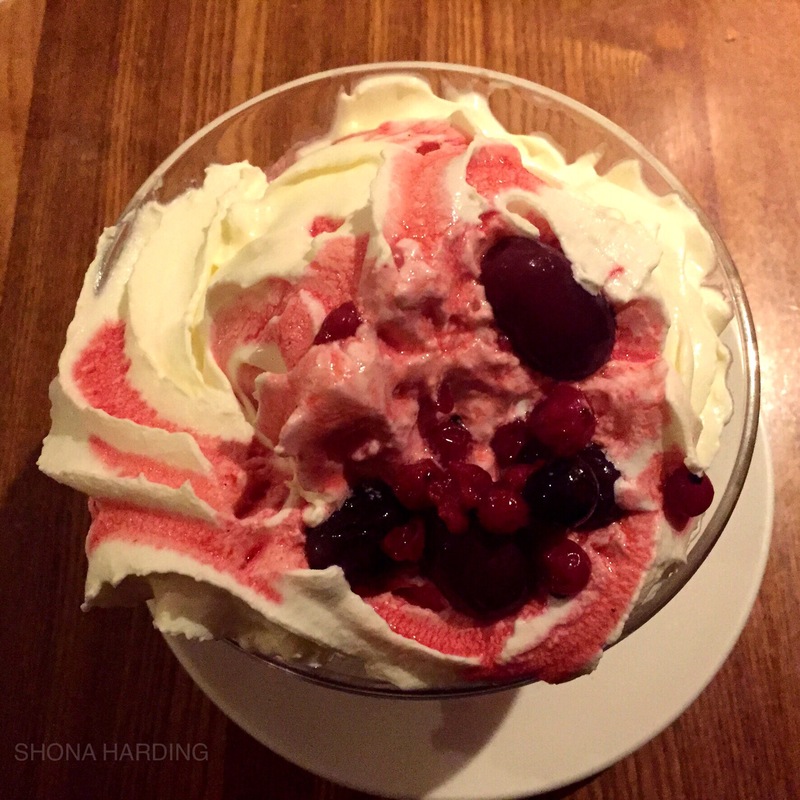 For dessert I had the Berry-licious Pavlova. 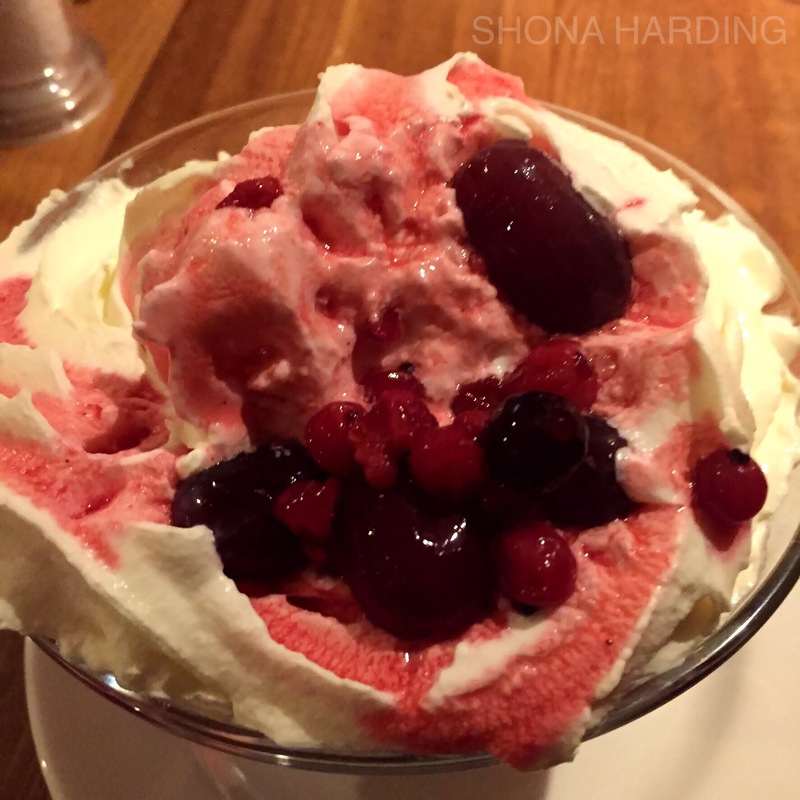 They also do an eton mess sundae which is similar but this one was under 400 calories. This came with cream, ice cream and fruit with fruit sauce. The fruit was quite sharp but nice – I didn’t really understand the grapes though. I really liked this though as it wasn’t too filling so made a nice end to the meal dessert. Because we had some issues, well they brought out the wrong dessert at first! The lovely manager gave us some hot drinks for free so I had a hot chocolate which was very rich in chocolate but quite nice. 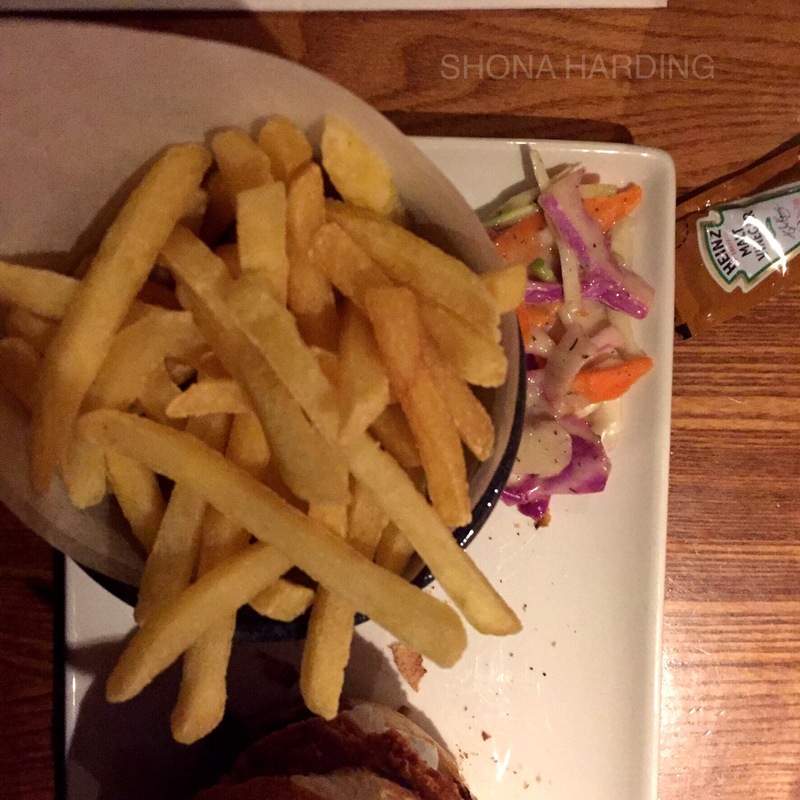 Have you ever eaten at a Premier Inn restaurant? Absolutely. It adds a lot of comfort to the stay. While I usually sleep in luxury hotels to review them, Premier Inn is actually a decent choice in smaller cities!